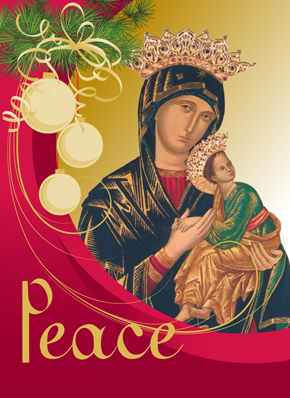 Share the gift of God’s love this Christmas with a solemn octave of Masses celebrated by the Redemptorists in Rome beginning Christmas Day and ending January 1, 2014. The Masses will be prayed before the original icon of Our Mother of Perpetual Help. Enrollment is free, but your donations support the ministries of the Redemptorists, especially those to the poor and most spiritually abandoned. Christmas cards may be ordered online from our gift shop, and donations may be made safely and securely online. If you need assistance ordering cards, please call us toll-free at 877-876-7662, Monday through Friday from 9 a.m. to 4:30 p.m. Eastern time.